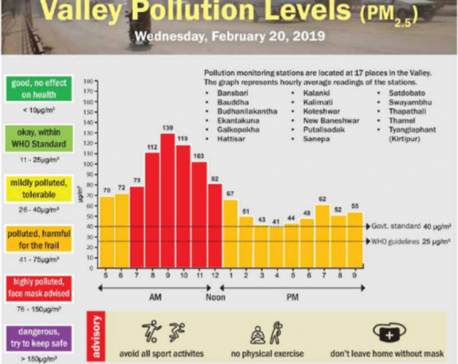 KATHMANDU, Feb 15: While Kathmandu Valley denizens are forced to gasp for clean air, the continually deteriorating air quality of the valley can be drastically improved with simple immediate actions, suggests an action plan recently submitted to the National Planning Commission (NPC). An Air Pollution Control Taskforce Report prepared by a team of environmental experts and senior government officials has presented simple and doable actions that could be carried out during the ongoing fiscal year 2016/017 and the next fiscal year. 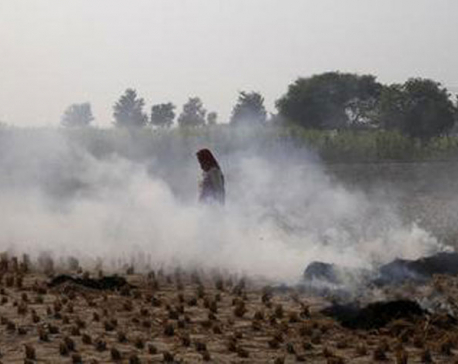 A study conducted by the Ministry of Population and Environment (MoPE) about ten years ago states that vehicular smoke contributes 38 percent to the total air pollution and roads' dust adds up to the pollution by 25 percent, while burning of fossils and brick kilns are other factors behind the country's air pollution. Ten years after the MoPE study, almost two million vehicles have been added on the country's roads, shows the data of the Department of Transport Management (DoTM). As vehicles are the biggest contributors air pollution and the number of vehicles has drastically increased of late, the taskforce action plan has estimated the current air pollution to be very severe. The report recommends six activities to bring an immediate respite against the heavy air pollution in the valley. These actions are - banning public littering immediately and making garbage collecting effective; setting deadline to blacktop roads and sprinkling water on dusty stretches; strengthening vehicle emission testing system (Green Sticker); promoting electric vehicles by removing all import taxes on such vehicles and validating the use of diesel and petrol vehicles; and implementing the Kathmandu Sustainable Urban Transport Project (KSUTP) to properly manage traffic and public vehicles. MoPE, municipalities, Department of Roads, Melamchi Water Supply Project, Metropolitan Police Traffic Division, Ministry of Finance, KSUTP, Ministry of Home Affairs, and Ministry of Physical Infrastructure and Transport have big roles to play in the implementation of these recommendations, states the taskforce report. 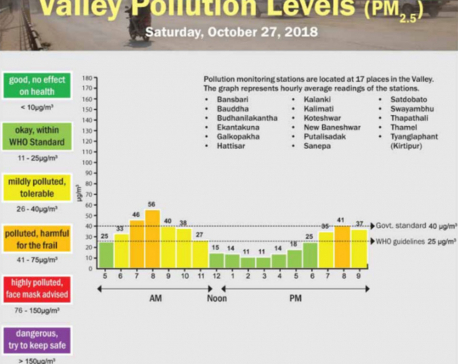 A study by Nepal Health Research Council has found that the annual limit of PM2.5, a very harmful microscopic particulate matters known for causing various respiratory illness and cancers, exceed the limit set by the World Health Organization by five times. Keeping in mind the severe hazards of air pollution, NPC member Prabhu Budhathoki took the lead to conduct interaction between the stakeholders and experts. They discussed what kind of initiatives could be taken at their level. Following the discussions, a taskforce was formed under the leadership of the Director General of the Department of Environment to prepare a doable action plan. Altogether, the taskforce report has proposed undertaking 12 activities of which six have been attached a high priority.